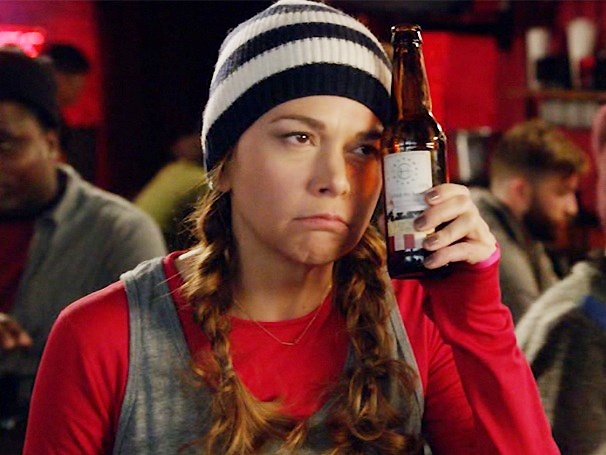 I was a little bit disappointed with the past episodes of “Younger” and was draging my feet watching Episodes 9 (“I’m With Stupid”) and Episode 10 (“The Boy With The Dragon Tattoo”) but seriously, these two episodes are exceptional, and forward the story more. On “I’m With Stupid,” Liza begins to have insecurities with his relationship with Josh. One of Josh’s close friends mentions to her that she thinks he is dumb, and that idea permeates in her mind. The snob in her comes out when she finds out that he doesn’t like to read. (He rightly explains that as an artist, he is a more visual person) Meanwhile, a manuscript from the slush pile catches her eye, and she uses her old book club in New Jersey to get feedback on the book. Everyone loves it. On Episode 9, (“The Boy With The Golden Tattoo”) we find out that the author (Ana Gesteyer in a great guest spot role) plagiarized the piece. Liza’s doubts for Josh comes full circle here as well, when she gets introduced by him to his friends as a girl who he is “just hanging out” with. At the end of the episode, he proves his mettle by showing Liza he got a dragon tattoo (to symbolize the year of his birth) Both these situations give pause as Liza realizes the lie she is living with. With two episodes to go, I am curious and intrigued as to how the season will end – will the lie come out, or will it continue to the next season?